Skylodge Adventure Suites, Unique is the word: Check out these hotels! Skylodge Adventure Suites, Peru – To sleep at Skylodge, people must climb 400 meters of Via Ferrata – and conquer a zipline course! 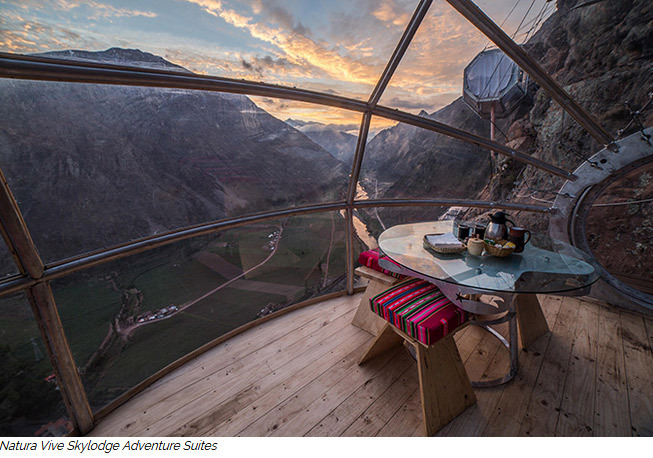 And while sleeping in these luxurious glass capsules, hanging from a mountaintop in the Sacred Valley of Peru, may personally give ME the willies, you can’t deny it’s a unique and exotic experience! Getting there: Fly into Cusco’s international airport. The Skylodge folks will take you from there.